Amidst growing protests of young people against the election of Donald Trump, including high school walkouts throughout the country, leading Democrats are doubling down on their pledge to work closely with the president-elect once he assumes office in January. On Wednesday, Vice President Joseph Biden gave incoming vice-president elect Mike Pence a tour of what will be Pence’s new home in Washington, DC. 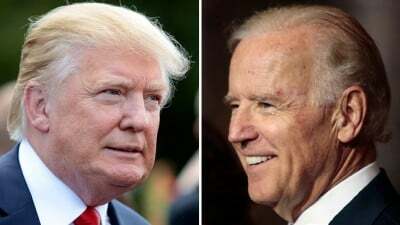 The cordial meeting concluded with a brief statement from Biden that he was confident that the office would be in “good hands” from “Day One” of the new Trump administration. Pence responded with equal praise: “We’re just very grateful for the hospitality today from the vice president and the second lady,” referring to Biden’s wife. Biden added that he would be “available to [Pence] 24/7” to assist and act as a “senior staff” to the new vice president. The two joked about a debate over whether the Pence family would have a dog in their new residence. Biden’s meeting with Pence exposes the indifference of the Democratic Party even in relation to issues that have long been its focus. Pence, an “evangelical Catholic,” is in particular known for his deep opposition to abortion rights and gay marriage, as well as the viciously anti-working class policy he has pursued as Governor of Indiana. Also on Wednesday, Senate Democrats chose their new minority leader, New York Senator Chuck Schumer, an individual with long-standing and deep ties to Wall Street, as well as a personal relationship with Trump. Trump has also previously donated to Schumer’s election campaigns. As a member of the Senate Finance Committee, Schumer helped oversee the bailout of the banks following the 2008 crash, while protecting Wall Street from any government oversight and regulation. He has also played a critical role in funneling Wall Street contributions into Democratic Party coffers. Schumer told reporters at a press conference on Wednesday, “When we can agree on issues, then we’re going to work with him.” He added that Democrats would wage a “strong, tough fight” on areas of disagreement. Schumer also announced that the Senate Democrats were expanding their leadership council to include 10 members. The most significant addition was that of Vermont Senator Bernie Sanders, who returned to his status as a nominal independent following his defeat in the Democratic Party presidential primaries earlier this year. The elevation of Sanders to a leading role is aimed at giving the Democratic Party a “left” cover even as it shifts further to the right in the aftermath of the elections. Sanders will have the role of “Chairman of Outreach” in the Democratic Senate Caucus. There are also discussions over the possibility that Democrats will appoint a Sanders supporter, Representative Keith Ellison, as chairman of the Democratic National Committee. Remarking on the appointment of Schumer, the New York Times published an article Wednesday under the headline, “Senate Democrats’ Surprising Strategy: Trying to Align with Trump.” Noting that “Democrats are looking for ways to work with Mr. Trump,” the Times sought to present this strategy as a “populist” alliance between Democrats and Trump against Republicans in Congress. In fact, the areas of possible agreement between the Democrats and Trump underscore the right-wing character of the burgeoning political alliance. Among the principle policies discussed is a combined measure that would slash corporate taxes to fund infrastructure proposals. Last year, Schumer supported a bipartisan proposal in Congress that would have allowed foreign companies to bring back profits oversees, to be taxed at a far lower level than the nominal 35 percent corporate tax rate. The proposal also would guarantee that any future profits made by US companies abroad would not be taxed at all if brought back into the US, with corporations only paying local taxes where the profits were made. The proposal backed by Schumer would use the one-time levy on profits that have already been accrued to fund limited highway infrastructure spending. Another possible area of agreement cited by Democrats is measures to restrict foreign trade and implement a more nationalist economic policy, particularly in relation to China. Schumer has long backed legislation to brand China a “currency manipulator,” criticizing the Obama administration for failing to act aggressively enough. The statements from leading Democrats follow Obama’s press conference on Monday, when the outgoing president praised his “cordial” relationship with Trump and insisted that Americans must “reconcile themselves” to a Trump presidency. Obama also declined to comment on the appointment of Stephen Bannon, the racist and white supremacist head of Breitbart News, as his chief strategist. Beyond the specific areas of agreement between Democrats and Republicans under Trump, both parties, whatever their tactical differences, are committed to a bipartisan policy of war, attacks on the working class and the destruction of democratic rights. It is for this reason that the Democrats are desperately seeking to cover up the extremely right-wing character of the incoming administration.